Well, what I learned was that these teams are pretty much exactly the same statistically as they were a year ago, with a couple differences – the thing that stands out most is the improvement of the Bengals’ defense from a year ago. They weren’t ranked any higher than 19 in any major category last season, and now they’re not below 12 in any of the same metrics. As for the Ravens, I find it interesting that, though the offense and defense have both seemed a bit better than they did last season, they enter Week 17 13th in scoring offense and 3rd in scoring defense – just like they did last year. All of this is, of course, relevant to nothing really. I was just curious. Back to the game at hand. This contest shaped up just the way the NFL wanted it to when they made the schedule – both teams have everything to play for. Cincy doesn’t NEED to win to lock up the final AFC Wild Card spot – but they would need help if they don’t. On the other hand, if they win, they’re in. Pretty simple from that standpoint. The Ravens need a win to secure the AFC North title and the conference’s #2 overall seed. While again, they don’t NEED to win for that to happen, they would need some help if they lose. And let’s be honest – nobody expects the Cleveland Browns to step up and beat Pittsburgh for Baltimore on Sunday, so a loss would in all likelihood relegate them to the #5 seed and yet another bridesmaid spot in the AFC North race. Baltimore and Pittsburgh could both, depending on what New England does, finish the day as high as the #1 seed or as low as the #5 seed. It’s a lot simpler for the Ravens, though – win and take next week off, then play the AFC Divisional round at M&T Bank Stadium, where they went a perfect 8-0 in the regular season. Easier said than done, especially against a hungry Bengals team that gave the Ravens all they could handle back in Week 11. Cincinnati, though, has gone an unimpressive 1-6 against teams with winning records this season. The Ravens, for their part, have struggled mightily on the road, going 3-4 so far with their only wins against hapless St. Louis and Cleveland, along with a last-minute win in Pittsburgh. Add to that that they’re a mere 2-6 in Southern Ohio since Marvin Lewis showed up, and something will have to give on Sunday. The Bengals have been less than impressive lately. Since nearly completing a huge comeback in Charm City, they’ve beaten the Browns by a field goal, gotten stomped by Pittsburgh, lost at home to a T.J. Yates-led Texans squad, won in St. Louis by a touchdown, and barely held on at home against John Skelton and the Cardinals. Again, the same could be said of the Ravens though. Their Thanksgiving night win against San Francisco was something to hang their hat on, but other than that they’ve beaten up on the Browns and Colts, and gotten smoked in San Diego. Last week they looked well on their way to a beatdown of Cleveland, only to let the Browns pull within a single score by the end. Sunday’s game will likely, as so many do, come down to which team protects their quarterback better while getting after the opposing gunslinger. In Week 11, the Bengals managed only a single sack of Joe Flacco, while the Ravens were unable to get to Andy Dalton at all until the key final minutes, when they brought him down twice. The two defenses come into the game #2 (Ravens) and #3 (Bengals) in sacks, with 47 and 44, respectively. The problem is that the Bengals do a good job of getting pressure with only four pass rushers, while the Ravens tend to need to dial up blitzes to get home. That’s exactly the kind of defense that gives the Ravens’ offense fits, so they’ll need to protect Joe like they were able to the last time these teams met. Not helping matters is the uncertain status of Marshal Yanda (ribs, thigh) for Sunday’s game. Hopefully the extra day of rest will be enough to get him back on the field, otherwise Andre Gurode will be counted on to stand up against the Bengals’ stout front. Ray Rice had a good day statistically against Cincy last time around, with 104 yards on 20 carries. Fifty-nine of those yards were on one play though, and if you take away that gain, he averaged only 2.4 yards per carry. Marvin Lewis has done a good job of keeping Rice “in the box” so to speak in the past, so unless Cam Cameron has something special up his sleeve for this week (highly doubtful), I’d expect similar struggles for the Ravens’ running game and underneath passing attack. It was Torrey Smith who the Bengals seemed to severely underestimate, as he pulled in 6 passes for 165 yards. They won’t be nearly as dismissive of the rookie out of Maryland this week, and with Anquan Boldin missing from the other side, should have no problems doubling Torrey all over the field. It will fall on the Ravens’ tight ends to represent themselves much better than they did against Cleveland last Saturday, when Ed Dickson, despite catching a touchdown, had two key drops and Dennis Pitta was never even targeted. While it would be nice for Tandon Doss or LaQuan Williams – or, for crying out loud, LEE EVANS – to make an impact, it’s probably a bit unrealistic to expect much from those guys at this point; look for lots of two-TE sets from Baltimore on Sunday. The Bengals will counter with their own rookie wideout, A.J. Green. Green was absent from the Ravens’ Week 11 win, and could still be dealing with some issues from a shoulder injury suffered against St. Louis. The young phenom had only 2 catches for 25 yards last week, but is already over 1000 yards for the season on 63 catches and has hauled in 7 touchdowns. Let’s hope he’s still not at 100%, but the Ravens’ secondary will have their hands full regardless. After watching the trouble they had in San Diego, it’s tough to be too confident, that’s for sure. And that’s not to mention fellow wideout Jerome Simpson, who had 8 catches for 152 yards against B’More last time, or tight end Jermaine Gresham, who pretty much had what could have been a key touchdown stolen from him. Chuck Pagano had better have a little better plan for these guys than he did for the Chargers, or even than he did the last time Cincy and Baltimore clashed. While the Bengals will by no means roll over on Sunday, I’m basing any confidence I may have on Cincy crumbling under the pressure of what amounts to a playoff game for both squads. The Ravens have won four playoff games over the past three seasons – all on the road – and will treat this game as such. The Bengals have proven themselves to be just a tad below the level of playoff-caliber opposition this season, and the Ravens should be able to continue that trend. Cincy will be a player in the AFC North for years to come with their young core. This year though, the Ravens manage to hold them off to sweep the division and bring home John Harbaugh’s first AFC North crown. 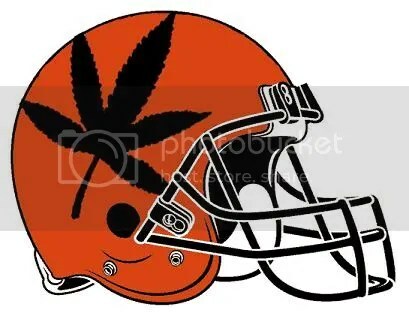 And if they don’t….GO BROWNS! For the Ravens’ final game of the regular season, they play the Cincinnati Bengals. 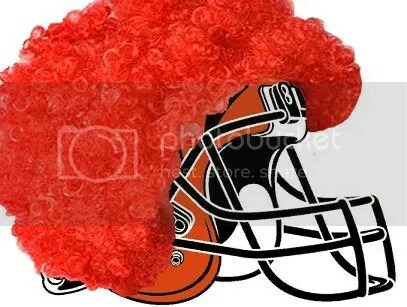 As has become recent tradition around these parts, we’re here to give Cincy some more…appropriate…designs for their helmets. 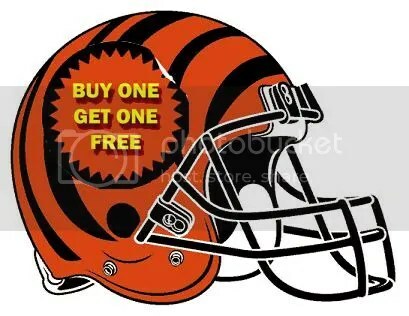 In order to sell out Sunday’s game, Cincy had to resort to some shady tactics in their ticket office – selling “buy one, get one” packages to season ticket holders. Pretty pathetic, Bengals fans. This one’s for you, Jerome. To thank us, please don’t do anything nearly that incredible against the Ravens, k? 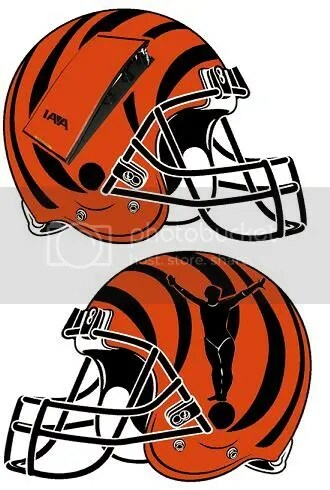 Finally…we couldn’t do Bengals helmets without a little ginger hate, could we? Fixing the NFL's "Popularity Bowl"
Let’s face it: the Pro Bowl is nothing more than a popularity contest. The Pro Bowl is not about showcasing the NFL’s best talent in an exhibition game; it’s about interrupting NFL players from their Hawaiian vacation to watch them play a few series. How can the most profitable sport in the world have such a horrible All-Star event? Starting in 2010, the NFL experimented with changing the location and date of the Pro Bowl. Even though they were trying to fix the problem, it made the game even more unattractive because Super Bowl players can no longer play in the game. The only good idea was to move the game to the Super Bowl location and create a more attractive Super Bowl week and drive up revenues for the home city as well as the NFL. Even though it was a good idea, the league quickly changed their mind after the complaints of millionaire players voicing their opinions to selfishly keep the game in Hawaii (for strictly vacation purposes). Regardless of where and when the Pro Bowl is played, the glaring need for this game to become attractive has to do with who is actually on the field. Clearly putting the biggest household names on the field to appease the casual fan isn’t working. Restoring integrity to this game may be the best way to not only increase its popularity but to also make it a “must watch” event for the league’s fan base a la the NHL or MLB equivalents. One thing the NFL needs to do is take out the popularity aspect, and only let deserving players touch the field, no matter how large (or small) their paycheck is. Since the Pro Bowl isn’t truly “for the fans” (it’s more of an incentive clause in a player’s contract) the fan voting aspect should be eliminated completely. Clearly NFL players and coaches know the other players the best but even they tend to favor the popular players as well. One option that should be suggested is to eliminate fan voting and replace it with a sports writers/media option. Combining the thoughts of players in addition to those who make their living covering the NFL and staying objective to the whole league may be the best way to evaluate who actually deserves to play in the Pro Bowl. Why not try it out? Clearly the way things are now isn’t really working. There are no better people to evaluate a single player’s impact on their team, along with their statistics, as NFL players, coaches and media members. Introducing this selection process will not only put a better product on the field but should make the game more interesting. The real football fans who can appreciate a player’s effort regardless of the name on the back of their jersey will make it a priority to watch this All-Star event. Introducing this aspect of player selection will more than likely eliminate the week long bellyaching sessions on major media platforms in regards to who was left off of the team. There are no clear arguments for why players such as Philip Rivers, Dwight Freeney, Antonio Gates, and Ed Reed Made the AFC roster. If more of an evaluation and critique process was introduced, players like Lardarius Webb, Matthew Stafford, Cam Newton and Ryan Clark won’t have to wonder why their efforts weren’t appreciated this season. The bottom line is the Pro Bowl is a yearly award. For every fan who says, “ (Insert Players Name Here) needs to what they did for another year and be more consistent to be awarded a spot on the team” just proves that this is a popularity contest and not about recognizing a specific players efforts for THAT SEASON! It’s weird saying that Ray Lewis and Ed Reed probably didn’t deserve to go to Hawaii this season but I’ll refuse to let my home team bias get in the way. Let’s look at Cal Ripken Jr. for instance; was he really the best Shortstop and Third baseman in the American League the 19 seasons he made the All-Star team? I love Cal but I think not. Enough with the popularity contest. Let’s start bringing in the players who actually deserve to be called an All-Star. 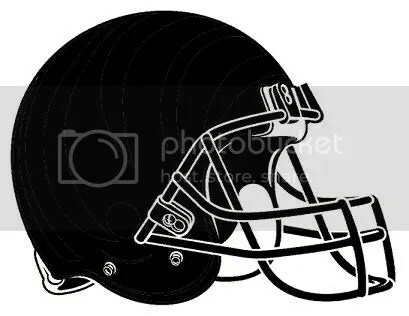 The Baltimore Ravens had seven players selected to the 2011 Pro Bowl, good for second most in the NFL. The New England Patriots and San Francisco 49ers each had eight players named to the NFL’s version of the All-Star game, while the Ravens tied the Green Bay Packers with seven apiece. Six of those Ravens selected were named starters; Ray Lewis, Ed Reed, Terrell Suggs, and Haloti Ngata from the defense, and Ray Rice and Vonta Leach from the other side of the ball. Guard Marshal Yanda will be going to Hawaii as a back up. Yanda was the only first-timer among the Ravens. It’s high time the former Iowa Hawkeye was recognized; since returning from tearing all three major ligaments in his knee during the 2008 season, Yanda has been one of the NFL’s top offensive linemen. He was forced to play tackle for B’More in 2010, but was able to return to his more natural position of guard here in 2011 – and he has been spectacular. Other than getting beat once Sunday for a sack, he has been nearly perfect in pass protection, and he has been a bulldozer opening holes in the running game. It’s a bit bittersweet for Yanda, as he receives the honor at a time when his status for the Ravens’ critical Week 17 match up in Cincinnati is very much up in the air. Yanda is dealing with contusions to both his rib area and thigh, and could be held out this week. As for the other Ravens, they will all be making at least their second trip to the Pro Bowl. Lewis leads the way, being selected to the game for the 13th time, followed by Reed (8th), Suggs (5th, first back-to-back), Ngata (3rd), Rice (2nd) and Leach (2nd). Five Ravens were also selected as alternates to the game: Ben Grubbs (first alternate), Brendan Ayanbadejo (2nd), Joe Flacco (3rd), Bernard Pollard (3rd), and Michael Oher (4th). Cary Williams: Williams ran into teammate Pernell McPhee on a Seneca Wallace scramble in the first half, and left the game with a concussion. His status for Sunday in Cincinnati is still very much up-in-the-air. Danell Ellerbe: The Ravens’ second concussion victim of the day, Ellerbe fell flat on his back while defending a short Cleveland pass. His head appeared to snap back and hit the turf; he wouldn’t see the field again Saturday. Like Williams, he will have to show significant improvement and pass the concussion tests to play next week. Marshal Yanda: Yanda suffered a rib bruise in the first half, and was replaced by Andre Gurode. The Ravens running game was much less effective with the former Dallas center in there than with Yanda. Coach John Harbaugh said on Monday that Yanda is also dealing with a significant thigh bruise. Yanda is perhaps the toughest guy on the team (once famously letting himself get shocked with a cattle prod for entertainment purposes), so I’d have to think that if he can play, he will. However, he’ll probably be questionable at best. David Reed: Reed, returning just his second kick since the debacle in Seattle, appeared about a step from breaking free for a touchdown after Josh Cribbs got the Browns on the board. 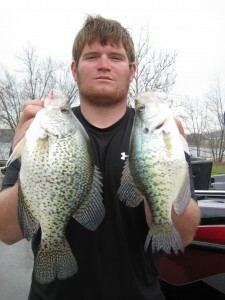 Instead, his knee didn’t cooperate when he tried to cut, blew out, and he was placed on injured reserve Monday. Cory Redding: Redding didn’t play Saturday, which came as a bit of a surprise. He was sorely missed, as Browns’ running back Peyton Hillis gashed Baltimore for his first 100-yard performance of the season. Redding tried to suit up, but didn’t feel up to it during warm-ups. He’ll likely be a game-time decision again in Cincy. Throw in Anquan Boldin, who is already certainly out this week, and the Ravens find themselves in quite a precarious position. On one hand, they are absolutely in control of their own destiny; a win will give them the AFC North title, a first round playoff bye, and at worst a #2 seed. On the other, they are banged up, and a loss (coupled with a Pittsburgh win at Cleveland) will relegate them to the #5 seed, and they’ll be going on the road for the postseason starting the very next week. Saturday’s game looked like it was going to be a perfect Christmas present for Ravens’ fans: a thorough beat-down of the inferior Browns from the opening whistle. They led 17-0 at the half, and 20-0 with 20 minutes left to play. However, the Browns would score 14 unanswered points, and the game ended up as much more of a nail-biter than it had any business being. It was the Ravens’ special teams that opened the door for Cleveland, allowing Cribbs an 84-yard punt return touchdown late in the third. It was the third touchdown allowed by Baltimore’s special teams this year (2 punt, 1 kickoff), tying franchise highs set in 1998 and 2002. They had appeared to get their act together in recent weeks – the last score they allowed was way back in Week 8 against Arizona – so hopefully this isn’t a key problem coming back to life to rear its head at the worst possible time. Cribbs tormented the Ravens early in his career, but they had done a good job of containing him over the past few seasons. The special teams opened the door, after which the inconsistent offensive and defensive units were both more than happy to do their best doorstop impressions. On the ensuing drive, Joe Flacco displayed the kind of up-and-down play that has driven B’More fans crazy all season. On 2nd-and-10 from the Cleveland 31, he scrambled for a 33-yard gain to the Browns’ 36-yard line. A field goal on that possession would have made it 23-7, a much more comfortable lead than 20-7. Instead, on 3rd-and-7 from the Cleveland 33, Joe woefully underthrew Lee Evans in the end zone, and was intercepted. Evans could have fought a little harder for the ball while it was in the air, but if Joe puts the ball in the back of the end zone, Evans is the only one with a chance at it. It was at least Flacco’s second underthrow of the day, perhaps even his third. And when he did manage to put the ball on his receivers’ hands, they betrayed him. Tight end Ed Dickson, who caught a touchdown pass on the team’s opening drive, had two key drops, one on a third down. Torrey Smith misjudged a throw on the sideline on the play preceding the Cribbs touchdown, which would have – if caught – extended the Ravens’ drive. And for all Flacco and the offense’s troubles, they weren’t the ones that allowed Cleveland to go 80 yards on the possession following the interception. That would be the defense, who also let the Browns to convert 3/3 third down tries on that drive. Were it not for some woeful Cleveland clock mismanagement at the end of the first half, and a boneheaded play by rookie defensive tackle Phil Taylor following the two-minute warning, we could have very well had another Cincinnati situation on our hands, with the defense buckling in the second half and holding on for dear life in the waning moments. It was far from a perfect performance on Saturday, but the end result is the same as if Baltimore had won the game 27-0 (like, say, Pittsburgh was able to do at home against the hapless rams, even without their quarterback): win in Cincy and get a week off and at least one home playoff game. 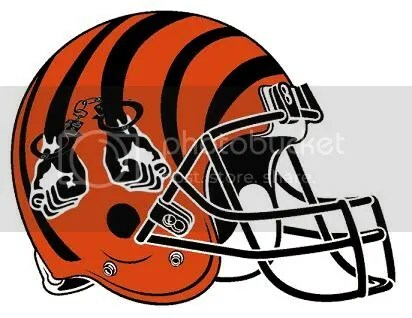 They’ll certainly have to play a much more disciplined and consistent brand of football, but let’s also remember that the Bengals are but 1-6 against winning teams in 2011. All eyes will be on the injury reports at Ravens’ practice this week – though Harbs is infamously vague on the status of his players, let’s all hope to see Yanda, Redding, Williams, and Ellerbe on the practice field. With the favor the San Francisco 49ers did for the Ravens in beating Pittsburgh on Monday night, Baltimore is back in control of their own destiny for the AFC North crown and a playoff bye. The Houston Texans lost to the Indianapolis Colts on Thursday night as well, and while not particularly important as long as the Ravens keep winning, it was nice to see another AFC “contender” fall flat on their face against inferior competition as the Ravens have themselves done more times this season than we’d like to remember. The Ravens, for their part, are trying to make a bit of history on Saturday afternoon, as they hope to complete their first ever undefeated regular season at M&T Bank Stadium. The Browns haven’t beaten Baltimore in Baltimore since the infamous “Phil Dawson Uprights” game back in 2007, falling by an average margin of nearly 19 points in three tries during the Harbaugh/Flacco era. They did give the Ravens a bit of a scare last year though, taking a 17-14 lead early in the fourth quarter before the Ravens reeled off 10 unanswered points for a 24-17 victory. Unfortunately for the Ravens, the quarterback that nearly beat them here last year, Seneca Wallace, will again be taking the field this time around, as Colt McCoy deals with lingering concussion symptoms imparted on him by James “Headhunter” Harrison over two weeks ago. It doesn’t say much for the Browns’ “franchise” quarterback when Ravens fans would rather face him than the career backup Wallace, who can extend plays much better than McCoy, and had a decent day at M&T last year, going 18/24 for 141 yards and a touchdown. It was running back Peyton Hillis though, not Wallace, who was the real thorn in the Ravens’ side on that day. Hillis rumbled for 144 yards on 22 carries, and made swiss cheese of the B’More defense. They have held him in check in two tries since then – 35 yards on 12 carries and 45 yards on 12 carries, respectively, during two games in Cleveland. This will be Peyton’s first game back in Baltimore since that big day, so let’s hope it’s not the local crabcakes that are the spinach that turns him into Popeye. The Ravens’ defense looks to rebound from an absolutely embarrassing performance in San Diego, where they failed to force even a single Chargers’ punt or turnover last Sunday night. They’ll be angry and ready to feed off the energy of the home crowd, so I don’t expect either Hillis or Wallace to have much of any success Saturday. Wallace is no Philip Rivers, and the Browns don’t have anything on their roster resembling the huge downfield threat wide receivers of San Diego. Rookie Greg Little is their leading receiver, and he’s had a season-long case of the dropsies. Lardarius Webb has not been listed on the injury report at all this week, and should be ready to slide back into his starting spot and resume his dominant 2011 campaign. While I don’t think his presence would have made much difference against the Chargers, it certainly couldn’t have hurt to have him playing more than just nickel snaps. On offense, the Ravens were actually not bad in the first half against the Chargers; the wheels didn’t really start to come off until they were down 24-7. They will look to repeat the success they had against the Browns three weeks ago, when they ran for 290 yards as a team. While Cleveland has improved their run defense a bit in the two games since, holding Pittsburgh and Arizona to 147 and 74 yards, respectively, those teams are ranked 17th and 24th running the ball, and neither has Ray Rice. The Ravens are a not-overly-impressive 16th running the ball, and while we probably shouldn’t expect another 200+ yard performance, Rice should again be able to break the 100-yard mark Saturday. The big news out of Owings Mills this week has been that Anquan Boldin will miss the team’s final two regular season games. Boldin’s numbers have been poor over the past several games, but his presence alone affects opposing defenses enough that it could be tough sledding without him. Many Ravens fans are excited about the prospect of potentially seeing rookie Tandon Doss lining up in the slot over the next two weeks to replace Boldin, as the team goes with Torrey Smith and Lee Evans on the outside. I would personally be surprised if Doss sees too much action though; the more likely scenario is that the Ravens run more two tight end/two WR sets, and split out either Ed Dickson or Dennis Pitta into the slot from time to time. His great toe-tapping sideline grab against Indy notwithstanding, we haven’t seen too much chemistry between Evans and Joe Flacco – certainly not nearly what we saw from the two in a couple preseason games. Now would be a great time for Evans to start to really contribute; the dual speedster threat of Evans and Smith on the outside should open things up underneath for whoever it is that lines up in the slot (not to mention Rice out of the backfield). However, teams have to see that Evans is more than just a decoy – and can actually hurt them deep – to pay him any appreciable level of attention. Look for Flacco to take a shot or two to #83 Saturday – the Ravens need to give the Cincinnati Bengals something to think about when they line up for what will likely be a huge contest in Week 17. That’s not to insinuate that the Ravens are looking past the Browns. They would be incredibly foolish to do so, as the “overlook” virus has infected them too many times already this season. Hell, it’s the reason they find themselves in their current position, needing to win out to take the division and get a playoff bye, instead of having already locked at least one of those things up. The team knows what they have in front of them, and I believe that going undefeated at home is something they all take considerable pride in. Add to that the fact that this will be the Browns’ third consecutive road game, and conditions are ripe for a blowout. While Cleveland has played two straight close games, they have to be running on fumes at this point. Sure, they’d love to play spoiler to the Ravens, but if B’More can get out to an early lead, it should be a fairly relaxing day at The Vault. The Browns will pack it in and be eager to just get out of town healthy. And it’s still possible that the Ravens could spend Christmas Eve evening as the AFC North champs, if the St. Louis Rams can go to Heinz Field and beat a (likely) Ben-less Steelers te…hahahahahahaha…yeah, I couldn’t even get through that. According to several reporters who cover the team (Aaron Wilson, Jeff Zrebiec, Luke Jones), Ravens wide receiver Anquan Boldin underwent surgery on Wednesday for a torn meniscus in his knee, and will miss the team’s final two games. He is expected back for the playoffs. With Boldin out, Lee Evans and Torrey Smith become the team’s starting wide receivers. Tight ends Ed Dickson and Dennis Pitta will be counted on even more than they have been to run the short-to-intermediate routes with Boldin sidelined. After leading the NFL in receptions (26) and yards (405) from weeks 6-9, Boldin has seen his production drop dramatically. He has only 16 receptions for 260 yards and one touchdown over the past six games. Still, the veteran WR is a key cog in the Ravens’ attack. I think they’ll be able to get along with Evans, Smith, and the young tight ends over the next few weeks, but a healthy Boldin will be crucial for the Ravens to accomplish what they’d like to in the postseason. According to a tweet from the team’s official account, the Ravens have signed veteran kicker Shayne Graham. The Ravens had Graham “on call” for the last several weeks, as regular kicker Billy Cundiff dealt with a left calf injury. Cundiff played both games, going 1/2 on field goal attempts against Indy and San Diego. Cundiff, while perfect a perfect 26/26 kicking field goals at home since last November, has been dreadful on the road here in 2011, going 10/19 (53%). His miss early in the first quarter Sunday night sapped any momentum the Ravens may have had after a decent opening drive. With the Ravens losing their inside track to the AFC’s #1 seed, they now face the very real prospect of playing at least one playoff game on the road. They can’t afford to have Cundiff and his 50% success rate going out there attempting a critical postseason field goal, so bringing in Graham is a very wise move. If the current playoff seedings hold, the Ravens would have to travel to Foxboro if both of those teams win their Divisional Round matches. Not that kicking field goals is the way to beat Tom Brady, but you still have to have faith in your guy. Graham is also a bit familiar with New England; he kicked for the Patriots for eight games in 2010, going a perfect 5/5 in games played in Massachusetts (12/12 overall in 2010). This year, Graham appeared in two games for the Miami Dolphins, going 4/5 on field goal attempts. Graham lost out in the kicking competition to Billy Cundiff at Ravens’ training camp prior to the 2010 season. Cundiff’s feel good story (the guy was selling insurance a couple years ago) could be coming to an end in the NFL. Though he signed a 5-year, $15 million contract with B’More last offseason, the new NFL kickoff rules make his strong touchback leg a bit less valuable. If he can’t rebound from this calf injury and figure out a way to start making field goals consistently (on the road as well as at home), the Ravens could very well move on from him permanently. Of course, his leg could heal up this week, allowing him to practice and show the coaches that he is indeed fine. In that case, Graham would likely be inactive against Cleveland, and maybe even Cincinnati. For now though, the former Bengal and Patriot is waiting in the wings as a valuable insurance policy to Cundiff. Goob is in the holiday spirit this week, as he is still giving away TWO SMARTPHONES. He also takes a look at the Christmas lists of some NFL players and commentators, as they post up on the lap of good ol’ Kris Kringle. You are currently browsing the Bmorebirdsnest's Weblog blog archives for December, 2011.